I hope you saved all the bones from your turkey, or other animal of choice (or if you are vegetarian, some peelings and things. Although those are generally not unique to our particular past holiday)! I should’ve reminded you beforehand but it’s hard enough to plan my own life sometimes, let alone that of someone I don’t know. Being gone all weekend (and most of the week too, come to think about it), I came back with very little food in the house and have been setting to remedy that. Yesterday was Stove Day—I had a pot of beans cooking alongside the pot of stock and also sautéed some veggies for dinner—and today I have had my oven going, baking bread and squash and chocolate rum raisin bread pudding (a coworker was about to throw away a stale loaf of bread today and I snagged it. Then the co-op had half-and-half at 50% off because its expiration day was today, so that worked out well). I spend a lot of time telling you all about how to eat locally, but a recent interesting New York Times article points out poignantly that distance is not the only concern in choosing your food sources: you need to pay attention to how it’s grown as well, and support sustainable growers wherever they are. Local and sustainable growers would be preferable to similar products grown sustainably elsewhere, for reasons of community development, etc, as well as mileage; but not everywhere has the same growing conditions. We accept that Maine does not grow coffee or cacao (although a friend of mine has mentioned a few times that he’d like to change that, gradually selecting trees and moving up the coast), and we can accept other products from elsewhere as well. That all being said, growing and eating local food is necessary insofar as we want to be self-sufficient (and therefore more secure in our food future), and so we’ll need at least a slight change in our regional diet to accommodate a truly sustainable and resilient food system (again, see A New England Food Vision). All interesting trade-offs that are important to think about. However, before you start finding books and articles about all this stuff, start making your stock, because it can take a while. I was just reading up on Mark Bittman’s stock-making suggestions for a bit of background, and I must admit that his technique differs slightly from my own. I’ve never made stock with anything but scraps, and while I’m sure it improves the stock to add extra meat and fresh veggies, it feels like a bit of a waste when you can make an excellent stock without them. Do what your budget and palate allow. But do make your own stock. It is delicious and makes such a difference to anything that needs stock. Or water. And is cheaper than storebought broths also. If nothing else, it’s an incentive not to freak out about getting every last bit of meat off the bones, like I usually do these days. Put everything in a large pot and cover with a few quarts of water. My instinct is to add as much water as possible, because it gives more contact with everything in the pot and thus more extraction power, but that also means you’ll have to take more time to reduce it and get more concentrated flavor. Set over high heat, and bring to a boil. A large pot will take a while to do this. When at a boil, turn down the heat so it doesn’t boil rapidly, and simmer. Cover if necessary, although it will reduce more if uncovered (and steam up your kitchen, which is good for cold dry winter). This is where you can pull out your reading material, or even go to sleep. 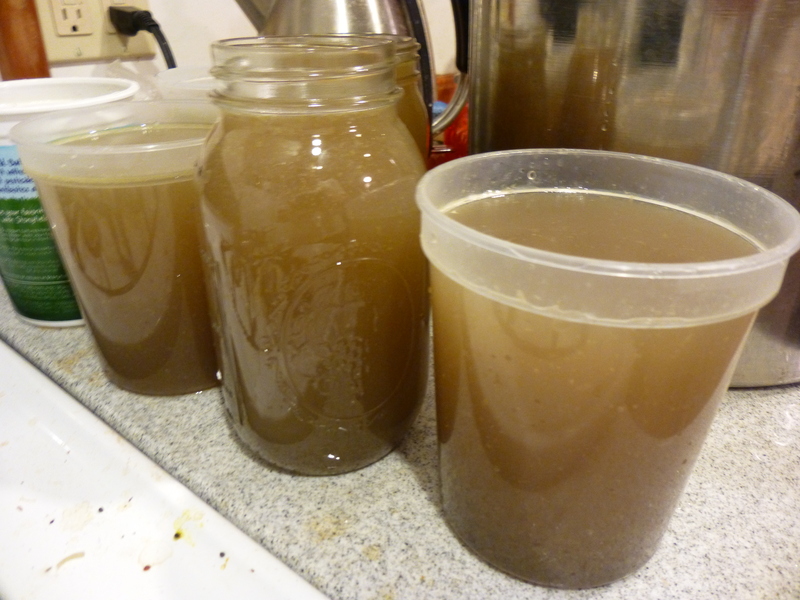 We always used to leave stock simmering overnight to get the most juice out of your bones, although if that makes your uncomfortable you can get a good stock from as short as an hour (or if you are very short on time, 20 minutes and some vegetables in water will serve you better than water). When you decide you’ve had enough, turn it off and let it cool. After letting it simmer overnight, I let it sit and cool during the day and strained in the evening (planning ahead is necessary. Pretty sure that’s okay from a health standpoint). Skim off the fat, if you can. Pour through a strainer into yogurt containers or other receptacles (if you can refrigerate it and skim off more fat, do that. I didn’t, but I think it’s a good idea). Label and freeze, or keep some in your fridge for a few days to use on hand. I couldn’t be bothered to reduce it as much as I probably could/should have, so I had quite a bit of stock. Still, looks pretty flavorful (apparently some people want a clear stock? That seems pointless). Use in soups, risotto, as bases for sauces, or instead of water to cook extra-delicious rice. I always need stock and am thrilled to have a bunch of containers in my freezer to use at whim. Plus it makes your house smell REALLY good.